Wow, where has this week gone? Suddenly it's Friday and I have no idea where it went. Excitingly, the week kicked off with an exciting project for Pitch & Post, my creative collaboration agency for brands and bloggers. I'm so proud of how it's shaping up and can't wait to share the results with you. For the meantime, I'd love it if you could show a little love and follow us on Twitter here. I really haven't had much time to think let alone blog (excusing the new season additions I've added to my boutique) but today I was walking in Soho to meet Reward Style and spotted tens of girls wearing culottes. It's taken me a while to get used to these as being on trend. I wore them at school to stop the boys being able to lift your skirt up in the playground (North London for you): they were armoury not fashion. But I'm coming around to the idea, particularly as I'll take any excuse to wear anything cropped at the moment and they look fab with little vests and shirts. 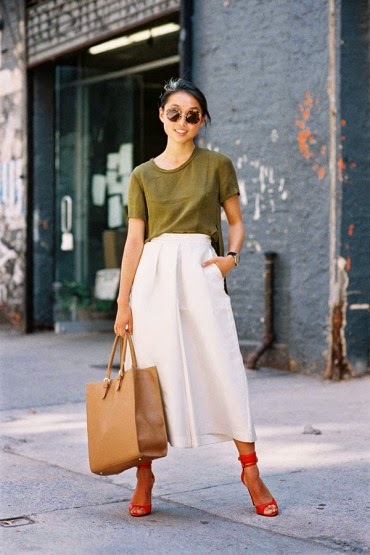 This red pair were the first to catch my eye having spotted them on the Topshop website earlier in the week. I love the statement they give if you paired them up with neutral vests or tees (this would look awesome with it). More on the casual side of things, I'm a wee bit obsessed with these denim ones - I mean imagine them thrown on with a pair of sandals and a khaki shirt, fresh off the beach = yes please. On the other end of the scale, Whistles just kicked the ball out of the park with this leather pair. I mean... YES. Paired with my new Peridot cropped shirt (best purchase ever, fabric is so good you don't even need to iron it...) and some coloured heels (this pair, need I say more?) and you've got my demi-corporate style nailed. I guess what I've worked out if they're not just for skinny, tall people - short, round (i.e. : moi) people can wear them too. I've fallen head over heels with each of these looks, thinking the leather pair might just trump the other two though - what do you think? Have a fab weekend guys and dolls, enjoy the SUN. 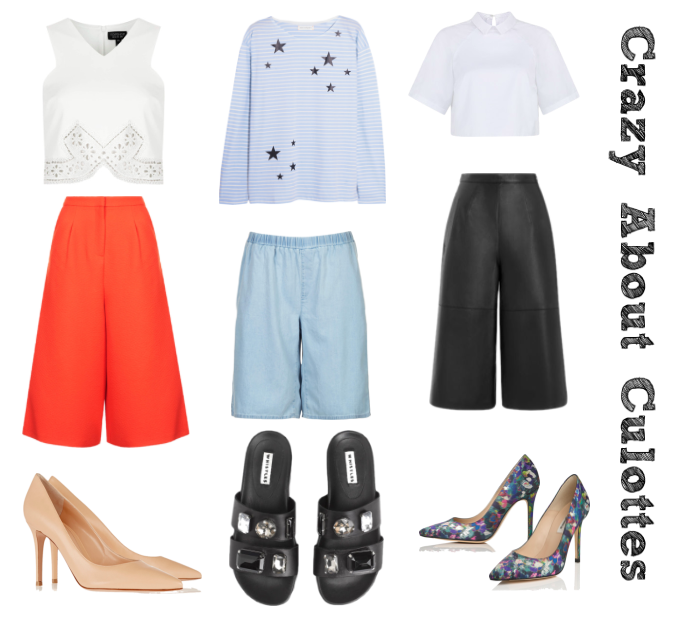 i'm so so into culottes! i loved them when i was at primary school - what's not to like about a 'skirt' you can do cartwheels in without flashing your pants? !